These days, we're bonkers for boho — bohemian bedrooms, bathrooms, kitchens, you name it. 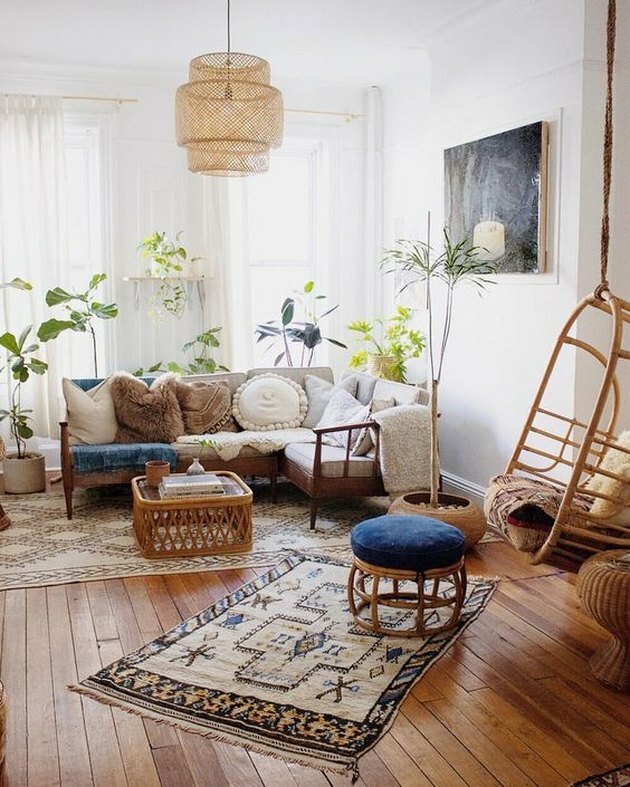 There are so many ways to do bohemian style, which is one of the reasons it's so appealing: Nearly anyone can find something they like in it. 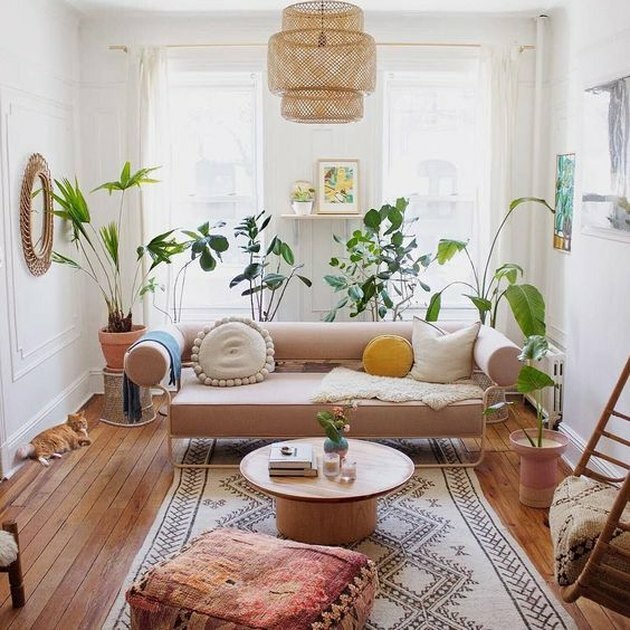 If you're really looking to make a statement, bring boho into the heart of your home: the living room. How AWESOME is Dabito's New Orleans house? The boho look usually relies on muted and neutral tones — and there's nothing wrong with that. But working in unexpected pops of color can make a design feel truly personal. 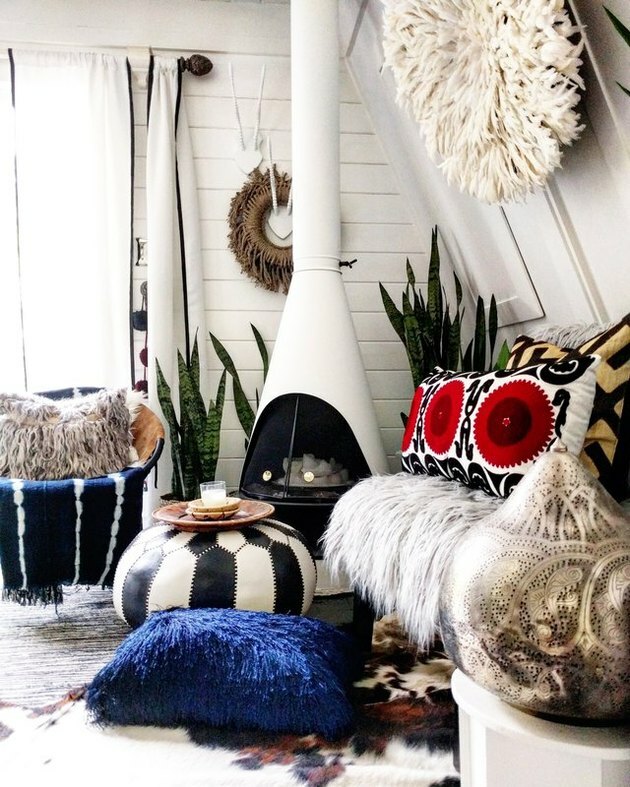 Interior designer Astrid Insieme's New Hampshire A-frame cabin might be petite, but it's packed with eclectic, boho flair like shaggy pillows, leather poofs, and Moroccan-inspired accents. This living room, created by vintage textile and accessories shop Reserve Home, makes excellent use of Ikea's boho-perfect Sinnerlig pendant ( and it's only $70 ). 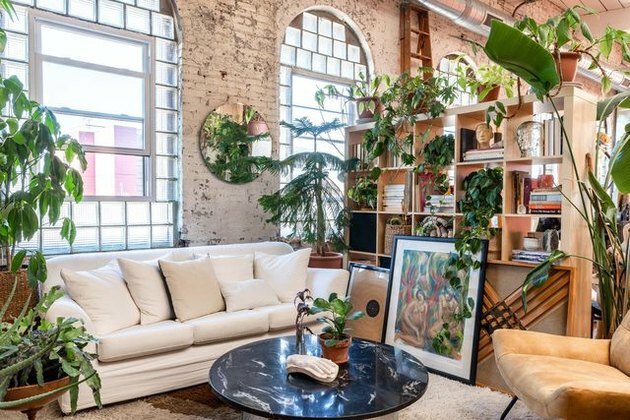 This space — a makeshift living room created in an industrial loft from the 1800s — is a perfect example of how busy can be best. Plants are key in bohemian schemes — you really can't bring in too many. 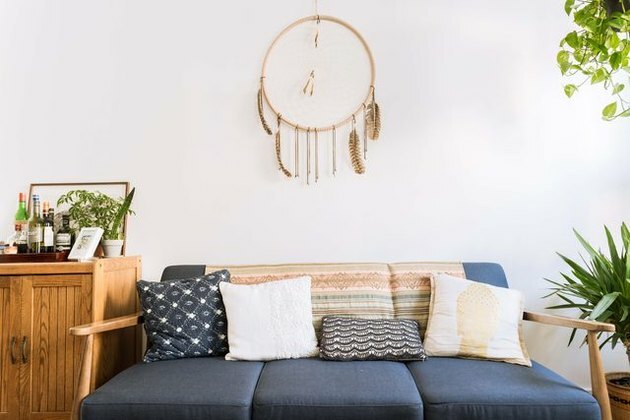 If you're starting with a blank slate, take some hints from this minimalist apartment: Try draping a handwoven blanket over the back of your couch, add some mismatched pillows, and scour Etsy for a cool dreamcatcher. 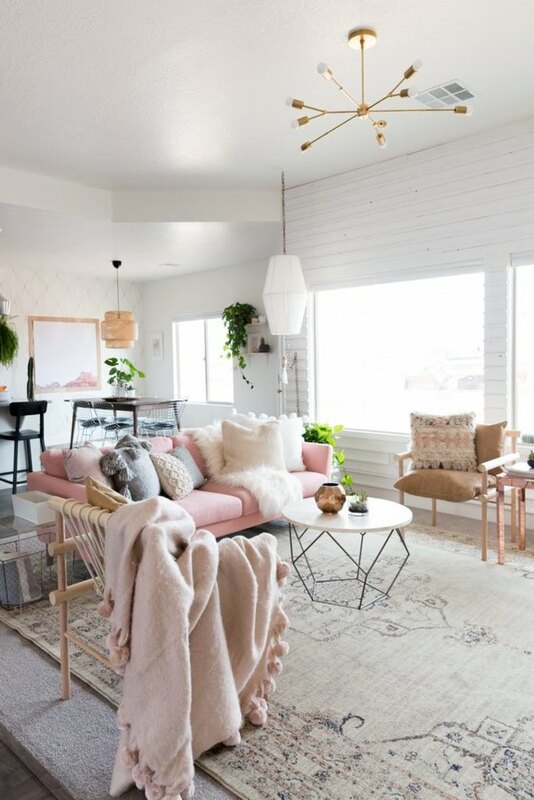 This room by Vintage Revivals is a reminder that you can push boho style in a more feminine direction with blush tones and brass accents. Bohemian + black-and-white = this subdued living room, which doesn't need color to make an impact. Instead it's all about textures and light and shadow. Also, if you're obsessed with the wall decor, check out our DIY for a boho fringed mirror. This San Diego living room brought to you by Sarah and Lou of A House in the Hills shows the importance of working with depth and levels. 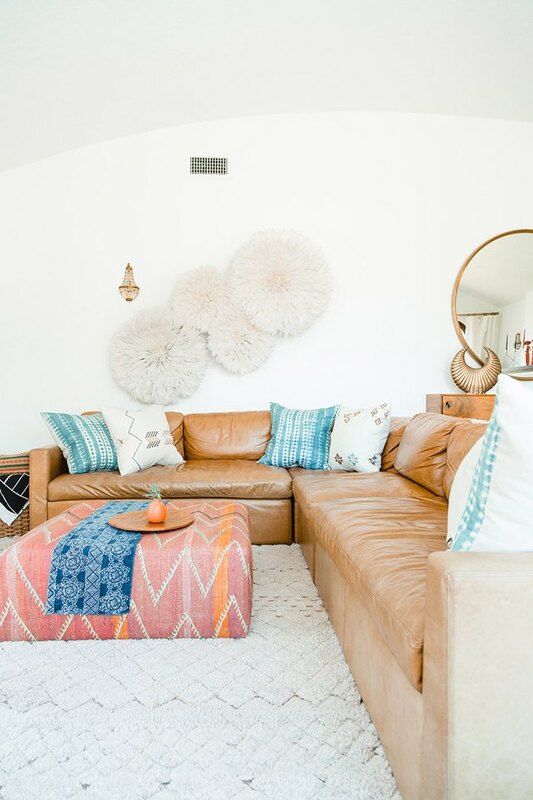 The textured wall art gives the room a more tactile feel, while a long leather couch lengthens the space (more boho for everyone!). Sometimes you don't need a million poufs to get on the boho train. 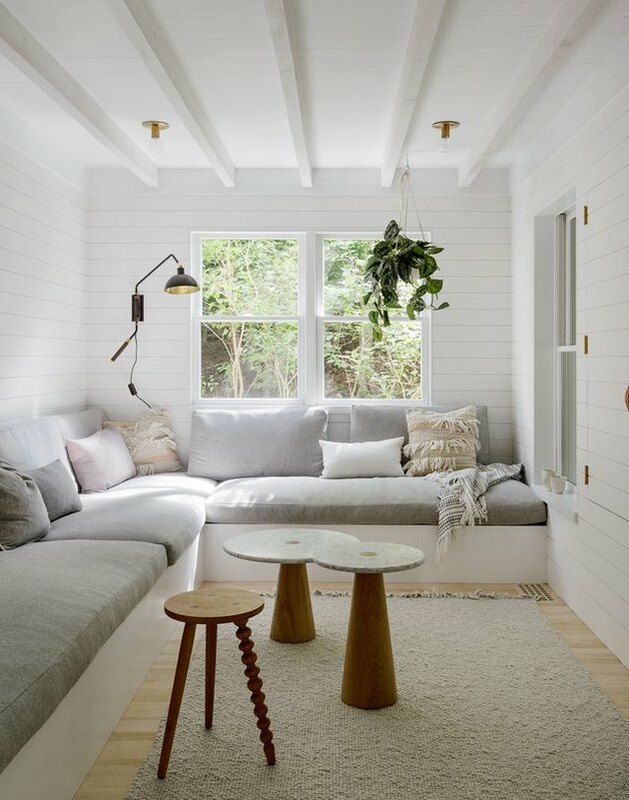 Take inspiration from this Scandi-chic beach house, which incorporates some bohemian elements (traditional textiles, plant life, wood accents) to create a design that's relaxed and adaptable. Here's another styling by Reserve Home that's awash in bohemian beauty: rattan furniture, layered Persian-style rugs, and brown/cream tones. This living room is sort of like boho-goes-to-Hollywood thanks to all that velvet and those midcentury accents. 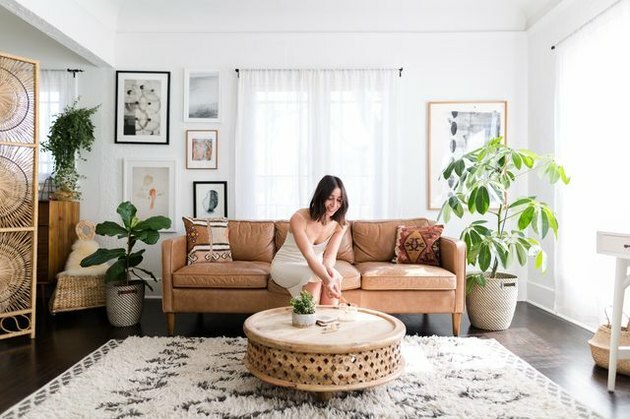 L.A.-based photographer Katherine Rose has figured out how to rein in boho style to accommodate a small space. 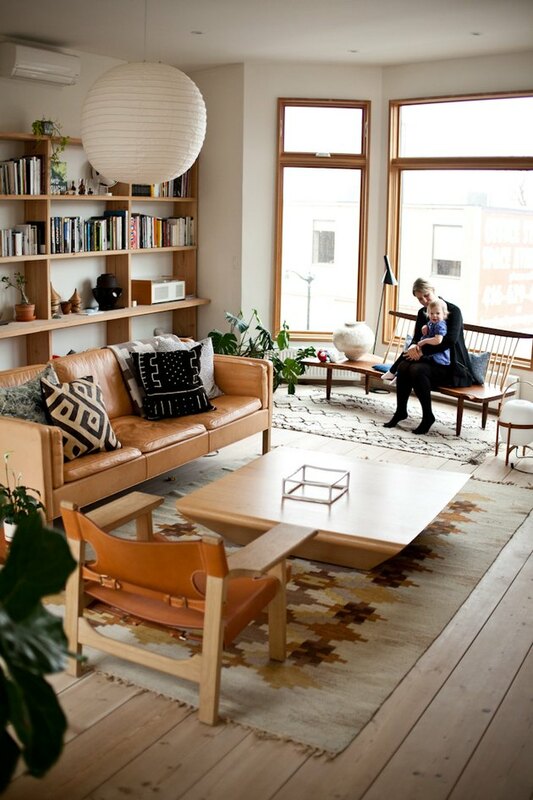 Who would have thunk it: A Scandinavian apartment that feels more midcentury-American? 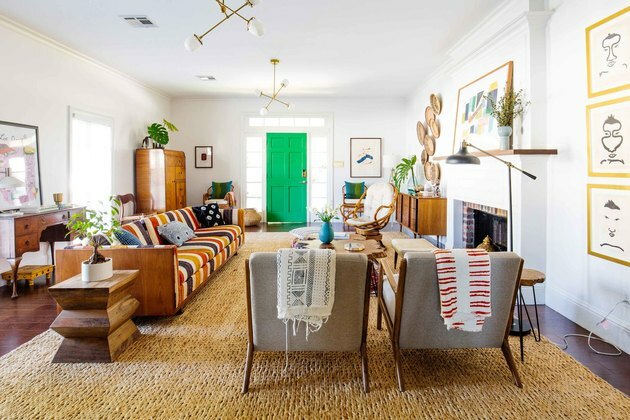 Either way, we are loving how midcentury pieces — like the leather seating, the wood bookshelves, and the patterned rug — combine with textured pillows and a lantern to give the room just a touch of boho flavor. 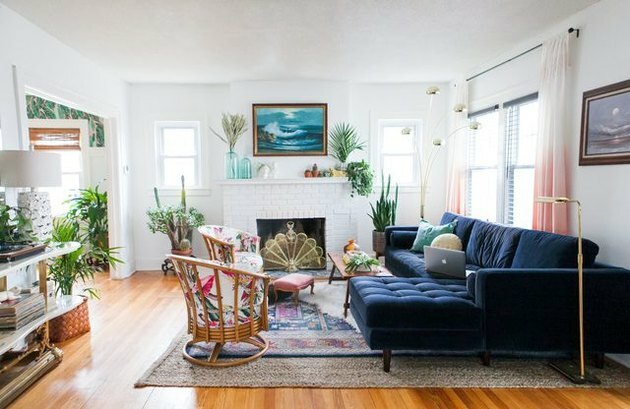 Can you believe that much of what you see in this living room is from Ikea? 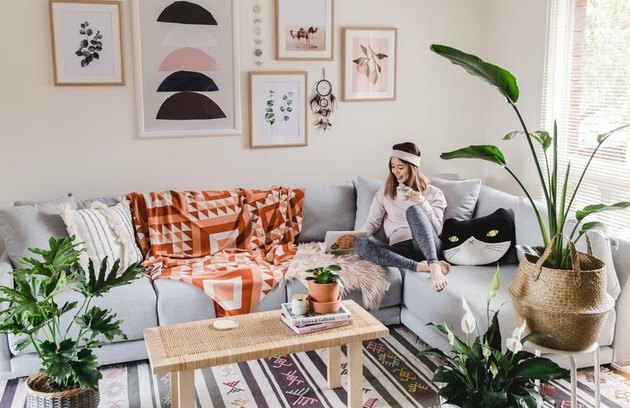 Australian blogger Connie Cao made over much of her room with items from the mass retailer (when we look closely, we can start to spot them). Plus, we love how she doesn't take boho too seriously — we're all for cat pillows. 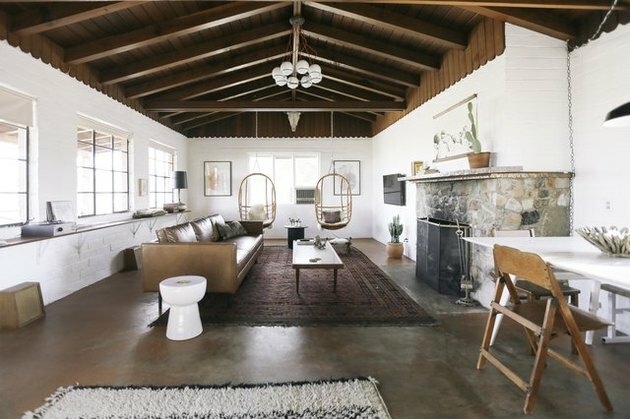 Southwestern-inspired decor is a close cousin to bohemian style, as evidenced in this cabin. 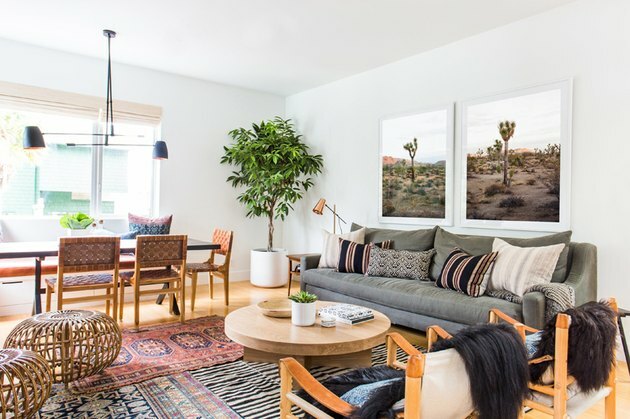 Amber Interiors' re-do of this Venice living room channels the energy of California with desert photography, layered rugs that convey laid-back cool, and rattan pieces that feel just slightly beachy. 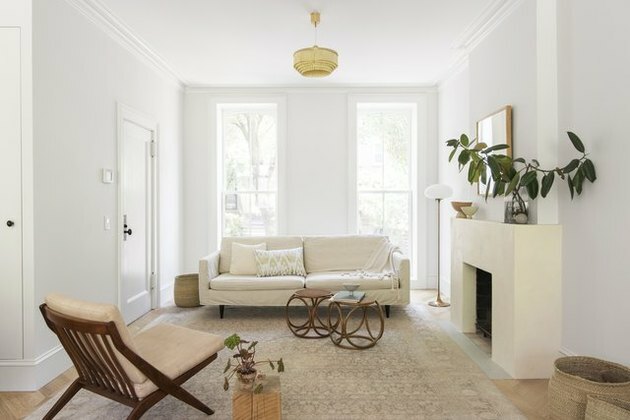 A townhouse in Brooklyn is a study in restraint with minimal furnishings and accessories. Perfect inspiration, tbh, if you've just moved and have little to work with. 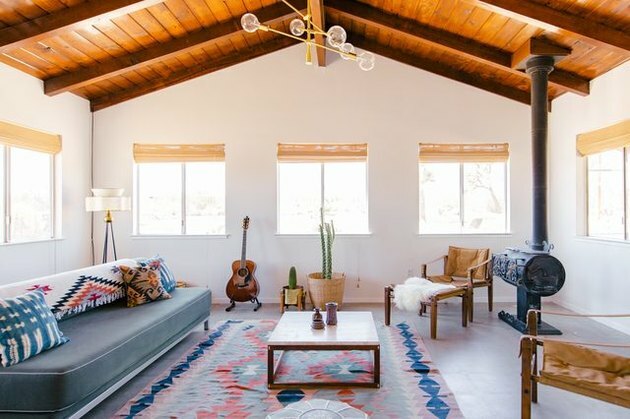 Step into this popular Joshua Tree rental, and you'll find yourself in a desert-chic, bohemian oasis complete with rattan hanging chairs, vintage rugs, and succulents galore. 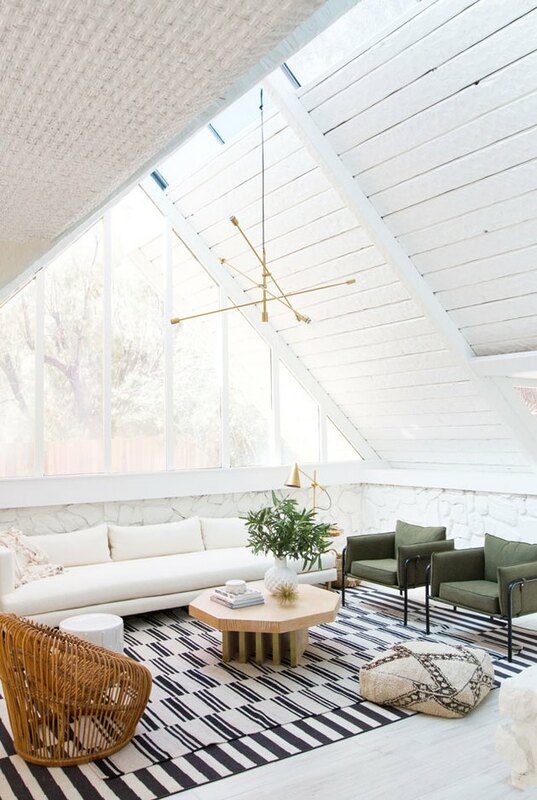 Designer Sarah Sherman Samuel is pioneering a new aesthetic that we can't quite classify yet, but we do know that it's at least one part boho, one part midcentury, and another part genius.